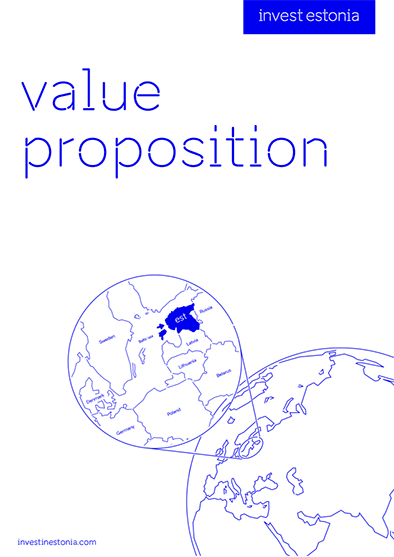 Welcome to use EIA's Value Proposition tool! To be able to load a .pdf file, it has to be created by the current version of the web tool. If the document has been edited / saved using another pdf application, it cannot be opened by the web tool. Who is the value proposition for? 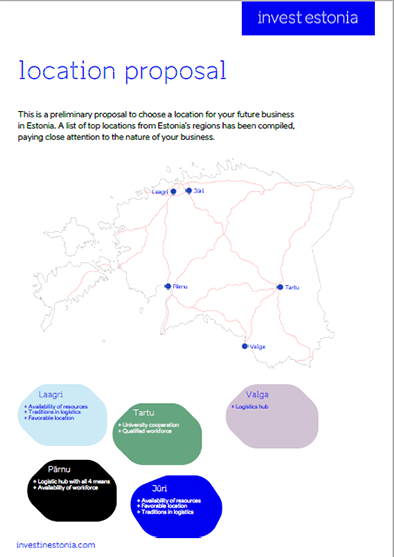 Which would be the most appropriate business opportunity to describe the company's interests in Estonia? The category is too general to include a location proposal. A map of industrial parks will be included instead. The category is too general to include a location proposal. A business opportunity was not chosen. It is recommended to use advanced options. Which countries are considered besides Estonia? If none are chosen, regional competitors will be displayed. TIP: In Windows use CTRL + click to select multiple. Choosing No gives you a quick value prop using system defaults. Should a cover page be included? Should a personalised introduction be included? Please personilise your text (address, contacts, etc). 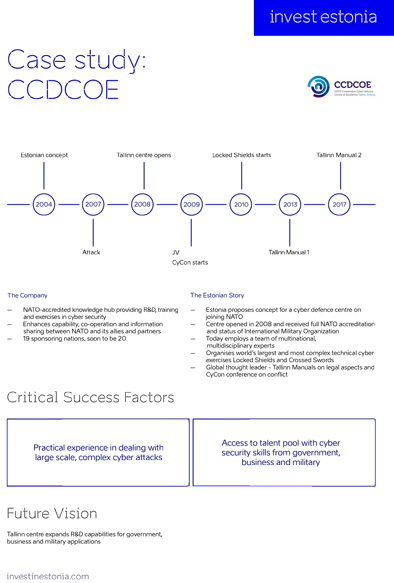 If you leave a template page empty, the page will not be inserted. To use headlines, select the text and click H1 or H2 or use markup ***Heading*** for H1 or **Heading** for H2. Which 'location of choice' page should be used for the document? 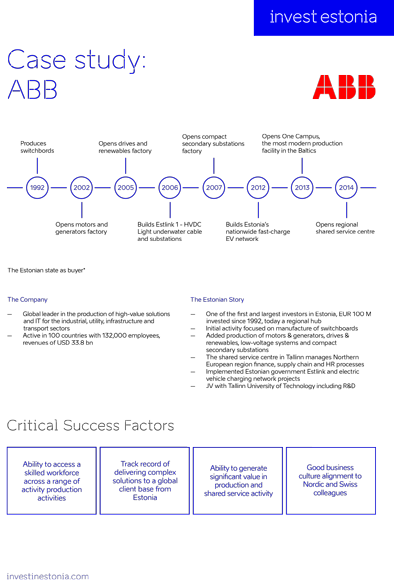 Which 'doing business' page should be used for the document? Which 'highlights' onepagers should be used for the document? ***Talent pool*** Estonia is a success story with regard to successful human capital potential maximization. The labour legislation is liberal and offers a lot of flexibility in agreeing on terms and conditions of employment. Trade unions have no significant impact on labour market. Estonia's labour market can be described by: + highly skilled workforce + simple and straightforward labour legislation + easy hiring processes + 86% of the population speaking at least 1 foreign language, mostly 2 (the most common foreign languages being English, Russian, German, Finnish) Wide possibilities to easily hire from abroad if needed: + simplified immigration processes for foreign specialists hired + monetary support to hire from abroad + variety of other services by Work in Estonia programme **Foreign recruitment grant** The grant is aimed at supporting recruitment of foreign ICT, science and engineering specialists. It helps to compensate foreign recruitment costs when an ICT specialist has been recruited from abroad (incl. both EU and non-EU countries). The amount of support per one recruited specialist is 3,000 euros. ***Science and education*** Estonia punches above its weight in science, being an attractive environment for research and education. **Research** Estonian researchers are highly valued partners in international cooperation projects with nearly half of the publications by Estonian researchers published in cooperation with foreign colleagues. The high quality of Estonian research is also visible in bibliometric indicators, i.e a high number of references to articles by Estonian authors. **Education** Estonia has 20+ educational institutions offering higher education. University of Tartu is the largest university in Estonia and one of the oldest universities in Northern Europe. It ranks #1 in Times Higher Education New Europe ranking. Tallinn University of Technology (TUT) is the flagship of Estonian engineering and technology education. Its modern campus is also a home to more than 200 high-tech companies (e.g. Skype). According to PISA tests, the results of Estonian 15-year-olds are the best in Europe and among the strongest in the entire world. Everyday skills of the 21st century, such as robotics, 3D printing and crypto currency mining are taught from an early age in Estonia's schools and in some cases even kindergartens. If you leave a blank template page empty, the page will not be inserted. This page was added automatically. If you leave a blank template page empty, the page will not be inserted. ***Taxation overview*** **Rates** + Corporate income tax: 20% + Corporate income tax on retained and reinvested profit: 0% + Tax on dividends: 14-20% (14% on regular dividend payments for legal entities) + Value added tax: 20% + Property tax: 0% + Land tax: 0.1-2.5% on the taxable amount + Social tax 33% (20% for social security and 13% for health insurance); minimum obligation for social tax to be paid is € 155.10 per month + Unemployment insurance: 2.4% on the gross salary (1.6% paid by employee and 0.8% by employer) + Personal income tax: 20% **e-Tax system** e-Tax is an electronic tax filing system set up by the Estonian Tax and Customs Board. 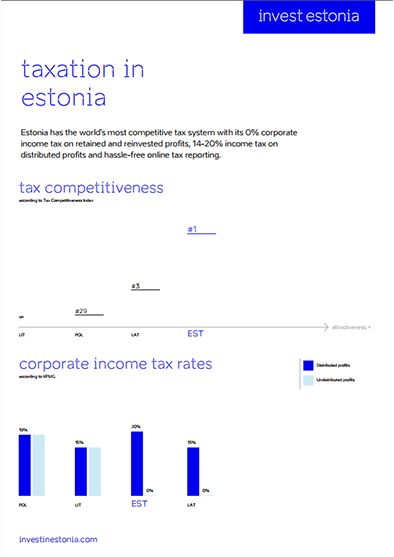 Each year, around 95 per cent of all tax declarations in Estonia are filed electronically. ***State support schemes*** **Large investor support scheme** Applicants must be registered in Estonia, have a consolidated turnover of 100+ MEUR/year and operate in the manufacturing sector. Maximum grant: € 1,000,000 The maximum grant percentage from the entire cost: 10% Own contribution: at least 90% **Investment aid to shared service and R&D centres** Applicants must be registered in Estonia, have a group turnover of 25+ MEUR/year, be present in at least 2 foreign countries and offer either support or R&D services to company’s core activity. Maximum grant: € 200,000 Grant for enterprises in Tallinn area - 35% of the project costs Grant for enterprises outside of Tallinn - 65% of project costs Supported activities: purchasing fixed assets, office renovation costs, HR sourcing costs, salary costs during the project period etc. ***e-Residency*** Estonia is the first country to offer e-Residency, a government-issued digital ID available to anyone in the world. E-Residency offers the freedom to easily start and run a location-independent business online using the convenient digital business services of Estonia. E-residents can: + establish a company online + manage the company remotely + achieve location independence The digital ID card and e-services are built on state-of-the-art technological solutions, including 2048-bit public key encryption and a two-stage PIN system. The digital ID card is not a physical identification or a travel document, and does not display a photo. ***Infrastructure*** Our industrial parks, free trade zones and developed infrastructure offer a great possibility to start your business quickly and easily. + Estonia's physical infrastructure has improved considerably in the recent years and our port infrastructure, for example, ranks clearly above the EU average. + The capacities are not only limited to infrastructure, but the biggest benefits lie in technological solutions. 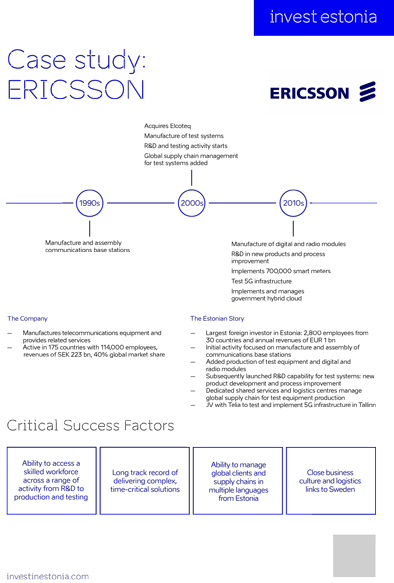 + Estonia's soon to be 5G networks and IT expertise create world leadership in physical-digital combinations. + In order to remain an innovative, effective and successful Northern country that leads by example, we continue to execute our vision of becoming a safe e-state with automatic e-services available 24/7. **Digitization of processes** Import, transit and export trade reporting as well as customs procedures are available via national online platforms. Digitization of processes, such as the transport and trade reporting information flow allows not only more comfort, but provides savings, better data quality, higher efficiency, faster operations and better visibility for business planning and analysis. ***Transportation*** **Airports** Estonia’s main international airport is located in Tallinn, the nearest European capital to Asia. There is another international airport in Tartu and regional ones in Kuressaare, Kärdla and Pärnu. **Ports** The ports are easily navigable all year round. Railway connections allow cargo delivery from seven ports. There are free trade zones located at three of them. **Railways** Estonia’s current rail gauge (1520 mm) is compatible with the railway networks in Eastern Europe and Russia. An additional rail connection (1435 mm) will link Estonia with Central and Western Europe. **Roads** Estonia has a high quality road network. There are 10 border inspection posts on the border with Russia. ***Utilities*** **Electricity** The Estonian power system consists of oil shale fired power plants in North East Estonia, combined heat and power plant near Tallinn, wind parks, and hydro plants. The Estonian power grid is connected to Russian and Latvian ones, as well as to the Nordic grid (via two maritime cables). The price of electricity comprises of four components: electricity, network service, renewable energy support, and excise duty. The price of electricity on the open market can be followed through Nord Pool Spot. 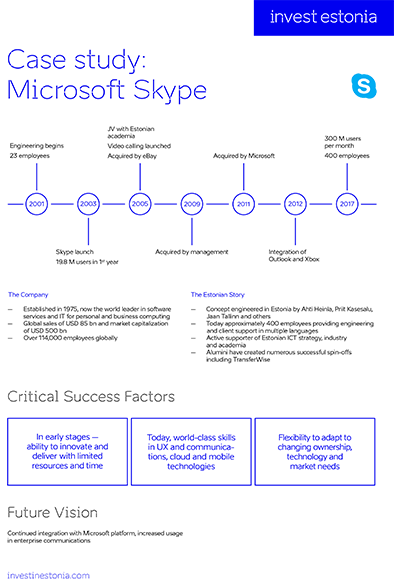 **Water** Water supply and waste water services are provided by local water companies. For example, in Tallinn the cost of one cubic meter of water for industrial use is about € 2.3 (excluding VAT). **Gas** Gas is imported from Russia and an underground gas storage in Latvia. 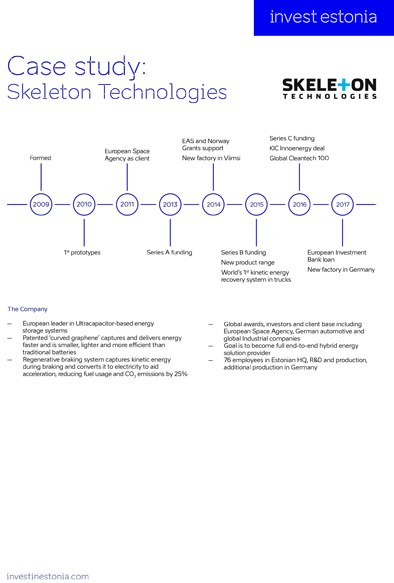 Industrial gas is distributed to customers through pipelines, distribution stations, and gas pressure reduction stations. The price of gas consists of gas, network service, and excise duty. The price of industrial gas is subject to negotiations on the basis of annual total consumption. ***Digital infrastructure*** Named ‘the most advanced digital society in the world’ by Wired, ingenious Estonians are pathfinders, who have built an efficient, secure and transparent ecosystem that saves time and money. 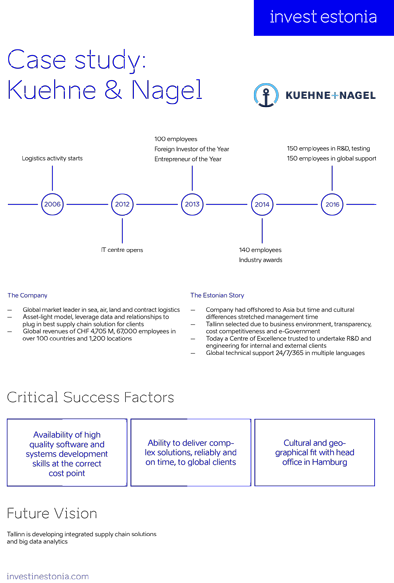 **Full digital ecosystem** Estonia aims to be one step ahead with innovation and boasts a full digital ecosystem, world class cyber-security, and soon-to-be 5G infrastructure (with trial networks already live). Our companies are world leaders in blockchain, connected networks, and clean-tech, and are at the cutting edge of IoT, big data, automation and real-time computing. We have digitally transformed our education system and are now combining biotechnology with the most advanced computer capabilities. 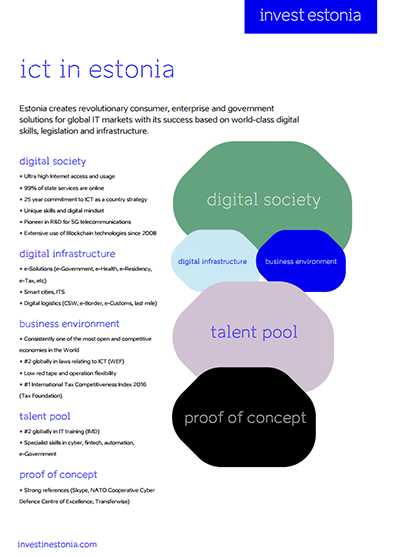 **Basic services into a fully digital mode** Building e-Estonia as one of the most advanced e-societies in the world has involved continuous experimentation and learning from our mistakes. Estonia sees the natural next step in the evolution of the e-state as moving basic services into a fully digital mode. This means that things can be done for citizens automatically and in that sense invisibly. Should the sector page be included? Should an opportunity page (template) be included? ***Food industry in Estonia*** Estonia has a sizeable food industry which benefits from ecological raw materials, skilled workers and modern production facilities. With an established export capability and growing application of food science and technology, Estonia is the ideal location for export and R&D oriented investment. **Long history of innovation** Estonia is a compact Nordic country benefiting from a pristine natural environment. Raw material inputs are high-quality, often organic and sourced from clearly identifiable local origins. Food production in Estonia, of which there are approximately 500 companies, is highly modernised and productive. Estonian workers are typically multilingual, possess higher or professional qualifications and are trained by world-class companies. Quality certification to stringent EU requirements is mandatory and modern equipment extensively utilised in production and packaging. Regional giants such as Orkla, Saarionen and Lantmännen export final product from Estonia to European markets. High quality Estonian raw materials are exported globally for use in food, beverage, health, animal feed and horticulture sectors. Estonia has a long history of food science innovation, including supplying Soviet space missions as early as 1962. Today Lallemand operate a cutting-edge, global R&D hub for functional molecules and directed evolution in Estonia in collaboration with Tallinn Technical University. Finnish dairy giant Valio conducts R&D into lactose-free and digestion improving foodstuffs. ***Energy industry in Estonia*** Estonia has a diversified energy sector which comprises long-standing expertise in oil shale, a sizeable renewables sector and growing CleanTech capability. World-class expertise within a highly digital, pro-business environment will see Estonia play a leading role in the energy revolution. **Growing sustainability** Sustainable energy capacity is growing year-on-year in Estonia across a range of segments including waste-to-energy, solar, wind and biomass. Estonia’s state energy strategy requires renewables to produce the majority of electricity and heat by 2030, enabled through public and private sector investment in capacity and connectivity. Estonia is also committed to sustainable consumption. In 2013 Estonia implemented the world’s first nationwide electric vehicle network in collaboration with ABB. Today gas is commonly used to power transportation and Estonia is a leading proponent of the Circular Economy, recycling by-products from oil shale mining in construction. As befits the world’s most digitally enabled nation, Estonia is at the forefront of applying technology to transform the energy sector. Skeleton Technologies, a pioneer in ultracapacitor-based energy storage and Cleantech 100 company, conduct R&D in Estonia. Planet OS, a big data provider for renewable energy, launched and went global from Estonia before being acquired by Intertrust. ***Bioeconomy in Estonia*** With over 30% of economic output already linked to the bioeconomy and innovative approaches to business transformation and policy making providing unique proof of concept and expertise, Estonia is set to emerge as a global centre of excellence in the field. Estonia has a large and growing bioeconomy which merges traditional skills in forestry, aquaculture and agriculture with cutting-edge technological solutions. **World-class expertise** Blessed with pristine nature, Estonian’s have centuries long expertise in harnessing natural resources in an efficient and sustainable manner. Estonia’s bioeconomy is driven by its world-class expertise in forest-based activity. Possessing an abundance of high-quality FSC and PEFC certified raw material, Estonia has a full value chain for export-oriented activity supported by a track-record of successful investments. Stora Enso’s significant, vertically integrated operations include forestry management, milling and value-added treatment services. Metsä Wood operates five sites in Estonia including a new EUR 50m energy efficient factory in Pärnu exporting plywood globally. Europe’s largest per capita producer of wooden residential and commercial buildings, 90% of which are exported to Northern Europe, Estonia is also a pioneer in Biomass and home to Europe’s largest wood pellet producer Graanul Invest. ***Marine industry in Estonia*** Estonia’s marine sector specialises in the design and build of small and medium-sized commercial and leisure vessels. Centuries long expertise, cutting-edge application of IT and a flexible approach make Estonia a competitive location for innovation and export-oriented production. **Modern methodologies** Estonia has a niche marine sector which provides design, prototyping and production of small and medium sized commercial and leisure vessels, electronics and equipment. With a centuries-long maritime tradition, Estonian workers have extensive expertise across a range of areas including materials science, hydrodynamics and manoeuvrability. Competence centres such as the TUT Estonian Maritime Academy ensure the workforce possess professional higher education and practical application of modern methodologies. As befits the world’s most digitally enabled nation, IT utilisation is ultra-high. Digital boats are created in the design phase, allowing clients to customise to exact specifications without sacrificing performance. 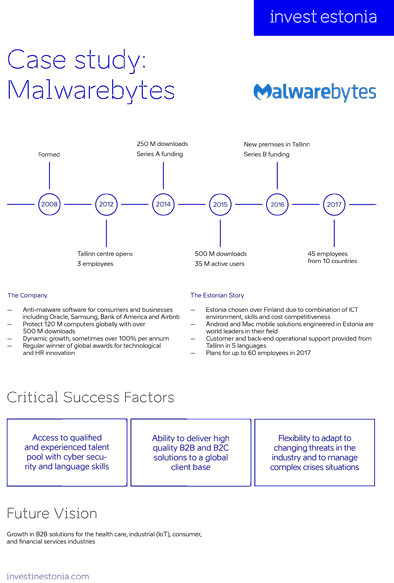 Sensors and software ensure accurate prototyping and testing. Automated production is seamlessly integrated with handcrafted elements to create high-quality, safe vessels with ISO certification. Today Estonian vessels of multiple sizes and materials are used in naval, rescue, energy, scientific and ice breaking operations in Northern Europe and beyond. Cybernetica’s systems and equipment for marine communication, surveillance and navigation are utilised globally. Smart Port, Maritime Single Window and e-Government solutions ensure efficiency and safety in daily operations. ***Chemicals industry in Estonia*** Estonia has an export-oriented Chemicals sector benefitting from a full value chain and world-class skills in oil shale, rare earth metals and petrochemicals. Our pro-business environment is competitive and trustworthy, with digitalisation applied to deliver new capabilities. **Unique experise** Belying its compact size, Estonia possesses globally unique expertise in oil shale and rare earth metals, and is highly experienced in the production, blending and storage of value-added petrochemical and fertiliser products. Estonia’s value chain, which is largely located in the Ida-Virumaa region, includes modern production and storage facilities; ISO accredited testing centres offering measurement, analyses and chromatography; and a growing R&D capability. A full logistics capability, including specialist storage, allows goods to be exported efficiently by sea, rail or road. **Trusted by global giants** Global giants such as Henkel, Neo Performance Materials, Ostchem and Tikkurila trust Estonia to produce high value, sensitive products. Eastman produces a range of speciality chemicals in Kohtla-Järve for export to global industrial, food and medical industries. ISO and FSSC accredited, the 66 acre site benefits from environmentally sustainable features such as shared power and water facilities. ***Industrial automation in Estonia*** Estonia has a sizeable Advanced Industrial sector and world-class IT expertise in areas including high tech systems, control technologies and cyber security. Supported by a collaborative ecosystem well suited to research and development, Estonia is emerging as a centre of excellence in industrial automation. **Technology to solve industrial challenges** Estonia has been applying technology to solve Industrial challenges for over 20yrs. Early adoption of robotics for productivity and quality gains led to the development of sensors and control systems by global companies including ABB, Columbus and Nortal. Over time the industry has become more sophisticated. Enterprise management systems such as those of Proekspert and Tieto are developed in Estonia for global use. Expertise in mechatronics with embedded software supports a hardware capability ranging from smart devices to autonomous delivery robots. 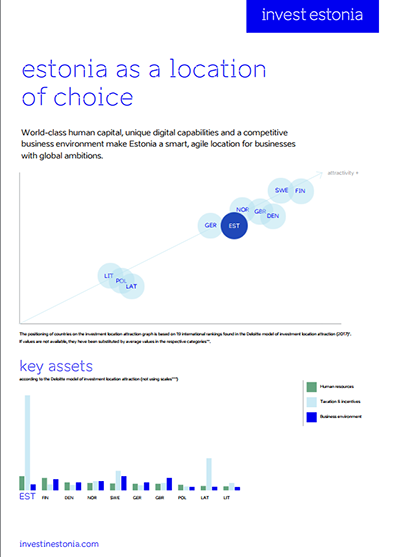 **Digitally enabled infrastructure** Estonia’s digitally enabled infrastructure, soon to be 5G (with trial networks already live), and IT expertise create world leadership in physical-digital combinations. Smart Grid, a network of connected smart energy meters, provides real-time and predictive data on consumption to stakeholders. 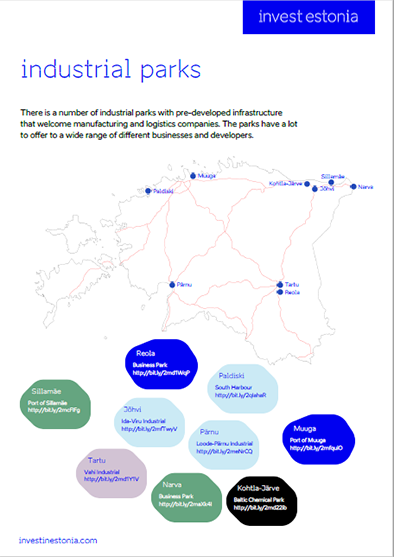 ***Industrial R&D in Estonia*** Estonia has a collaborative ecosystem for Industrial R&D including academia, accelerators and competence centres. Supported by world-class expertise and a highly competitive, digital environment, Estonia is the ideal location for Industrial product and technology R&D. Estonia’s Industrial R&D ecosystem supports startups and corporate R&D and has produced numerous innovations in sectors including mechatronics, energy, chemicals and food. Estonia’s advantages start early, ranking top 10 globally in the teaching of science, maths and IT. Nine universities and vocational education centres ensure the workforce possess professional knowledge and practical experience of modern technologies. Tallinn Technical University has a world-class capability in mechatronics and collaborates with universities and companies including MIT and Mitsubishi. **From smart factories to big data analytics** As befits one of the world’s most successful startup nations, Estonia’s accelerator ecosystem supports global commercialisation of software and hardware innovations. Five accelerators, backed by global firms including Telia, provide validation, mentoring, risk capital and market access for sectors including IOT, mechatronics and CleanTech. Four competence centres provide infrastructure and expertise to conduct applied R&D in collaboration with corporate and academic partners. STACC focus on Big Data analytics and security for software and systems; ELIKO develop algorithm and communication models for IOT solutions; IMESS specialise in materials technology, AI and smart factories; EII has conducted 40 global R&D projects in mechatronics and embedded software. A further three centres specialise in chemicals and bioeconomy activity. ***Blockchain in Estonia*** World-class technical skills supported by practical experience implementing public and permissioned Blockchain’s place Estonia at the forefront of the emerging Blockchain economy. **At the forefront of Blockchain economy** Estonia’s journey to becoming the world’s most digitally enabled nation began 25yrs ago when visionaries committed to IT as a country strategy and conceived X-Road, the decentralised, distributed information system on which e-Estonia runs. Today state services ranging from digital court to e-Health plus private sector service providers utilise the system. Blockchain usage is invisible to users yet the benefits are proven, ultra-high security, data immutability and 800yrs of time savings annually. **Blockchain innovation** Guardtime, the world’s largest Blockchain company, was born and continues to have significant operations in Estonia. Guardtime’s KSI Blockchain is utilised by clients including Verizon, the US and Thai governments, Lockheed Martin and Ericsson. Application of the technology increases rapidly and Guardtime has created the world’s first Blockchain platform of marine insurance in partnership with EY, Møller-Maersk, Willis Towers Watson, Microsoft and others. Blockchain innovation is high across a range of sectors where security and immutability at scale are critical. ***Digital logistics in Estonia*** Estonia is a world leader in the development and application of digital logistics. From data analytics and country single windows to mobile apps and delivery robots, Estonia improves supply chain efficiency and client experience from the first mile to last. **Sizeable logistics industry** Estonia is applying its world-class IT and engineering expertise to revolutionise supply chain efficiency and client experience from the first mile to last. Estonia has a sizeable logistics industry thanks to a strategic location which makes it an effective supply chain hub for the Nordic, Baltic and northwest Russian regions. The industry has applied IT extensively for 20yrs, from early automation of documents to modern day application of advanced robotics and data analytics. **Strong references** By combining a pro-business environment ideal for R&D with world-class skills in IT and engineering, Estonia has produced numerous digital logistics innovations. Starship Technologies‘ autonomous delivery robots have received strategic investment from Daimler AG; Cleveron parcel delivery solutions are adopted globally by Walmart, ASDA and Inditex; Tpilet smart ticketing has been acquired by Norges Statsbaner. 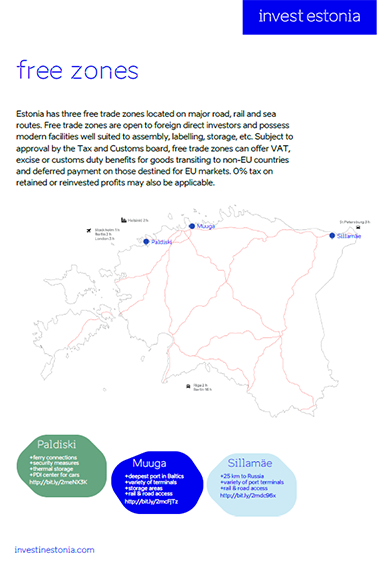 ***Logistics in Estonia*** Estonia is the most effective supply chain hub for the Nordic, Baltic and northwest Russian regions thanks to its strategic location, modern infrastructure, multi-modal capabilities and reliable approach. 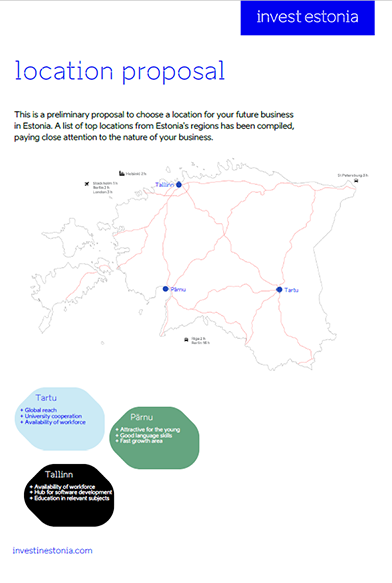 **Strategic location** Estonia occupies a strategic location with excellent multimodal connections to the Nordic, Baltic, EU and CIS markets, supported by necessary language skills and customs protocols. 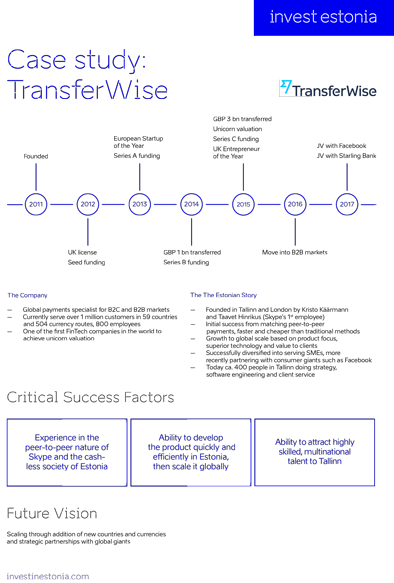 **Open and competitive economy** Consistently ranked among the most open and competitive economies in the world, low red tape ensures goods, capital and data flow efficiently. Our compact size and transparent business culture make it easy to secure decisions, grow and flex. Workers are highly-trained, quality accredited and experienced in managing activities ranging from complex just-in-time supply chains for ABB and Ericsson to chemical storage and foodstuffs. 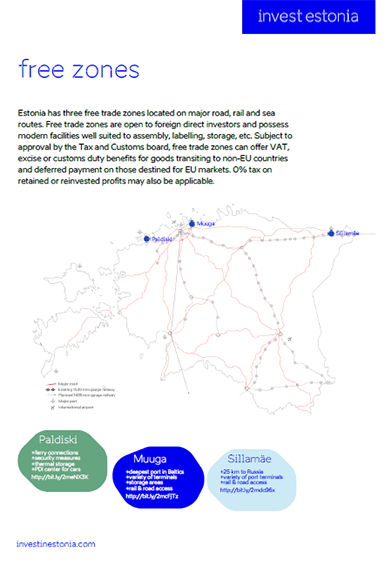 Estonia’s modern infrastructure is enhanced by the possibility to purchase or lease customised facilities within logistics hubs and free-trade zones. 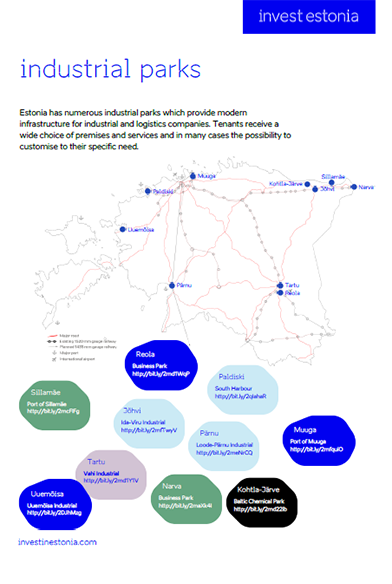 Whether your requirement is regional or global, Estonia has the infrastructure, expertise and IT to deliver accurate, efficient and innovative supply chain solutions. ***e-Health in Estonia*** Patient records in Estonia are digitised and secured by the Blockchain, providing a single immutable data source for healthcare professionals. With a unique digital platform and collaborative ecosystem, Estonia is positioned to lead on preventative medicine, patient self-treatment and industry efficiency. **A success story since 2008** Estonia’s e-Health journey began in 2008 when it conceived and built its state healthcare information system. Initially delivering patient data online, the system has since scaled to include new services, integrate private sector partners and Blockchain technology for archiving and data integrity. **95% of data digitised** Today 95% of data generated by doctors and hospitals is digitised. Unified health records including X-rays are available countrywide and prescriptions collectable on-demand utilising electronic ID. Patients, who own and can view their data at all times, benefit from convenience and trust; healthcare professionals are empowered to make informed decisions and the state saves significant resources. Leveraging Estonia’s world-leading IT industry, MedTech solutions ranging from Big Data analytics to mobile self-treatment are developed and aspects such as cloud, Blockchain and cyber security seamlessly integrated into everyday processes and services. ***e-Commerce in Estonia*** Estonia is an emerging hub for global e-commerce activity. World-class IT skills have created numerous e-commerce applications and are supported by leadership positions in enablers such as online trust, payments and digital logistics. 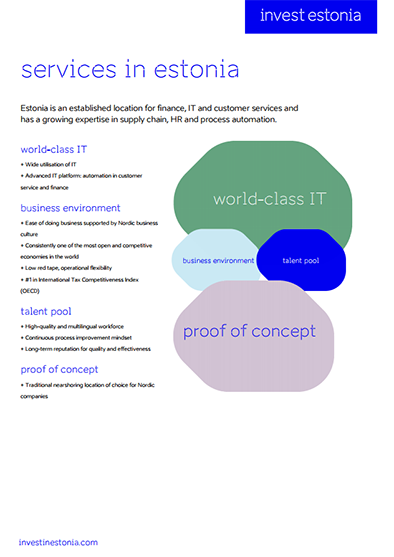 **World-class IT skills** World-class IT skills in areas including software development, location technologies, digital marketing and process automation have created numerous e-commerce solutions. Adcash’s digital advertising technology is trusted by Alibaba and 200m unique users every day. Google has conducted location-based technology R&D in Estonia and ReachU solutions are trusted by global telecoms companies. E-commerce platform providers Linnworks and Erply were born and continue to have significant engineering and client service operations in Estonia. **E-commerce enablers** Estonia also possesses expertise in numerous e-commerce enablers. Online trust is a particular strength thanks extensive use of electronic ID, Blockchain technology and a cyber security sector which ranks number one in Europe. Estonia is home to some of the world’s leading payment service providers including Fortumo and in digital logistics Cleveron’s solutions are utilised in Walmart, ASDA and Inditex’s multi-channel experience. Estonia will be among the first countries in the world to offer 5G infrastructure. ***FinTech in Estonia*** Estonia is a cashless society with over 99% of financial transactions occurring digitally. Electronic ID and Blockchain are widely utilised. 80+ FinTechs ranging from innovative startups such as TransferWise to Blockchain leader Guardtime make Estonia a global centre of excellence for FinTech. **Efficient and agile business models** Having committed to digital financial services 20yrs ago Estonia has developed unique skills and experience in the innovation and application of FinTech. Estonia’s FinTech journey has its roots in e-Estonia, when government, financial services and telecoms providers collaborated to create a unique environment. Digital service delivery was supported by the development of electronic ID, smart contracts, high-speed connectivity and enabling legislation. Nordic banks were early beneficiaries and continue to profit from efficient and agile business models. **Global success** In payments, Estonia has produced globally successful companies including Fortumo, award winning Monese and unicorn TransferWise, each of whom has significant R&D, engineering and 24/7, multilingual client service operations in Estonia. Estonia’s also possesses expertise in enterprise grade solutions, including Fitek’s F&A robotic process automation and Arvato Bertlesmann’s Innovation and Development centres of excellence. 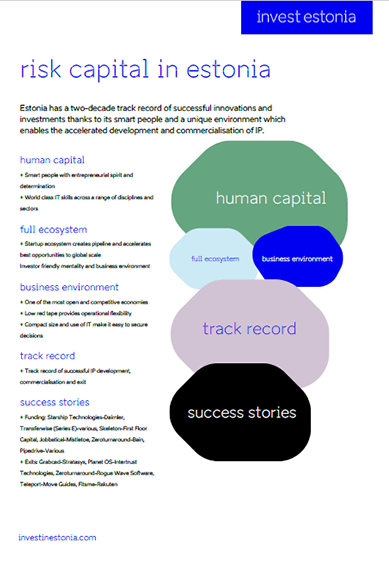 ***IT R&D in Estonia*** Estonia is the world’s most digitally enabled nation, offering a unique combination of talent, environment and innovation. Our IT R&D ecosystem enjoys global proof of concept, being trusted by global organisations such as Kuehne+Nagel and NATO and producing unicorn startups Transferwise and Taxify. IT is taught from primary school onwards in Estonia and the country ranks in the top 10 globally for the teaching of maths and IT. Numerous universities and vocational education centres collaborate with industry on knowledge and technology transfer, ensuring the workforce possess professional knowledge and practical experience. **Significant corporate R&D** Corporate R&D is significant in Estonia. Global organisations such as Kuehne+Nagel trust Estonia to conceive, develop and launch new logistics solutions. NATO conducts cutting-edge cyber security R&D in Estonia and NASDAQ has conducted successful Blockchain trials. Competence centres STACC, ELIKO, IMESS and EII provide facilities and expertise to conduct applied R&D in AI, Big Data and more. Estonia’s IT R&D ecosystem is enabled by modern digital infrastructure and a pro-business environment which is free of red tape, promoting accelerated innovation and launches. Government policy is highly supportive and has led to Telia trialling 5G in Estonia and Google’s use of new location technologies to improve emergency services. 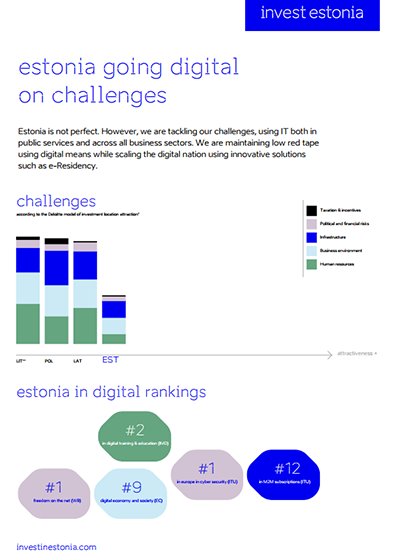 As digitalisation transforms life, business and government, Estonia’s combination of skills, experience and environment make it the ideal location for globally scalable IT R&D. ***Business services in Estonia*** With over 80 captive, BPO and ITO centres, Estonia is an established location for finance, IT and customer services and has a growing expertise in supply chain, HR and process automation. **An established location** Estonia is an established location for GBS thanks to its high-quality, multilingual workforce, flexible business environment, and sustainable financial attractiveness. 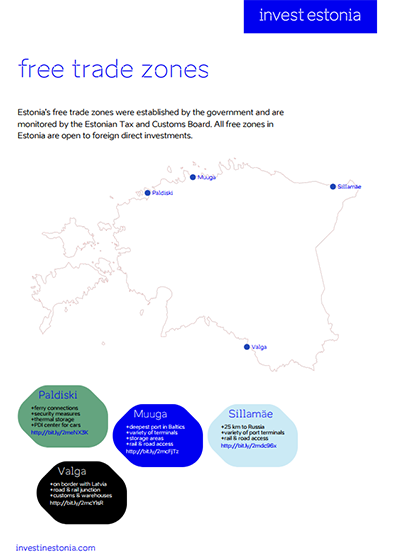 Estonia’s journey began in the 1990s as a nearshoring location of choice for Nordic companies. Since then the sector has expanded significantly, diversifying the functions covered and up-tiering in sophistication. **80+ SSCs** Today there are over 80 captive, BPO and ITO shared service centres in Estonia employing 8,000+ people. Multifunctional centres with regional or global responsibility and multilingual teams, such as ABB and Stora Enso, become the norm. Traditional strengths in IT and finance are augmented by growing expertise in supply chain and HR management. Estonia also specialises in government services, Tallinn being home to the EU LISA centre for operational management of large-scale IT systems and the NATO Cooperative Cyber Defence Centre of Excellence. ***Cyber security in Estonia*** The most advanced cyber security country in Europe, Estonia has unique expertise in the research, development and management of cyber security solutions and systems. Home to NATO CCDCOE, Guardtime and Malwarebytes, Estonia is trusted to keep the digital economy safe. Following its experience with the 2007 cyber attacks, Estonia emerged as a leader in cyber security and was recently ranked first in Europe due to its multi-stakeholder approach to technical, legal and operational cyber defence. Strong technical skills exist in many areas including intrusion detection, protection systems, encryption and use of Blockchain technologies to ensure data and system integrity and combat insider risk. **World-class companies** World leading cyber security companies such as CGI, Symantec and Malwarebytes use Estonia as a base to research, develop and manage consumer, enterprise and government solutions. Guardtime, the world’s largest Blockchain company, trust Estonia to provide their cryptographers, developers and security architects. Estonia is also expert at protecting complex high-tech systems, being home to the NATO Cooperative Cyber Defence Centre of Excellence (NATO CCD COE) and European Agency for the operational management of large-scale IT systems (EU LISA). ***Mechatronics in Estonia*** With a highly-qualified workforce and strengths in engineering, electronics and IT, Estonia is at the cutting edge of R&D, production and service for mechatronic solutions with embedded software. **Global client base** Estonia has a sizeable electronics industry undertaking R&D, prototyping, precision production and assembly of PCBs, supercapacitors, transformers and semiconductors. 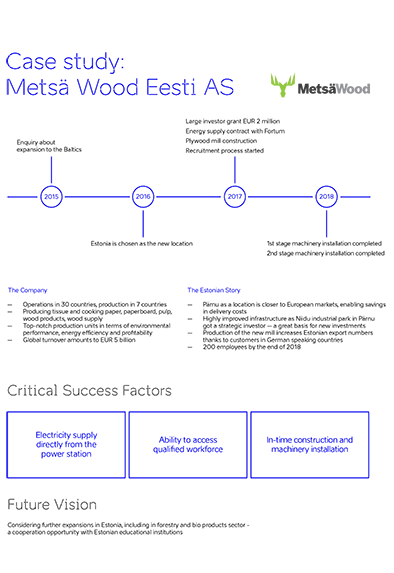 European leaders Enics and Stoneridge trust Estonia to provide high quality, cost-effective, on-time solutions for their global client base. Through lengthy collaboration with the mechanical engineering and IT sectors, Estonia has developed strong expertise in creating mechatronic solutions with embedded software. From safety systems for the automotive sector to complex industrial control systems, Estonia has unique capabilities supported by quality certification. **Homegrown innovation** Homegrown innovations increasingly attract global clients, awards and funding. Starship Technologies is a strategic partner to Daimler AG in the smart van-robotic delivery solutions. 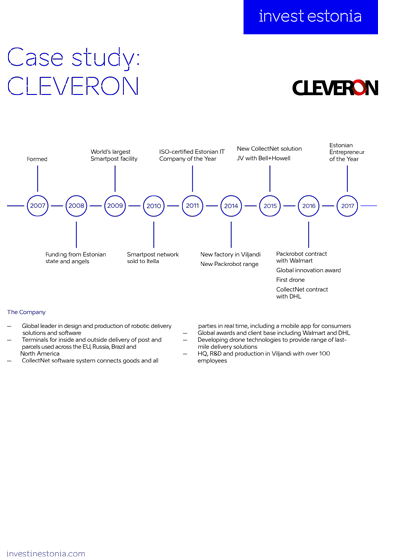 Cleveron parcel delivery solutions are used globally by the likes of Walmart. Software apps allow clients to personalise service and provide real-time data to business on performance and preferences. Which onepagers on opportunities should be added? If an opportunity onepager has already been used, the choice has been disabled in current field. ***Business services in Estonia*** With over 80 captive, BPO and ITO centres, Estonia is an established location for finance, IT and customer services and has a growing expertise in supply chain, HR and process automation. **An established location** Estonia is an established location for GBS thanks to its high-quality, multilingual workforce, flexible business environment, and sustainable financial attractiveness. 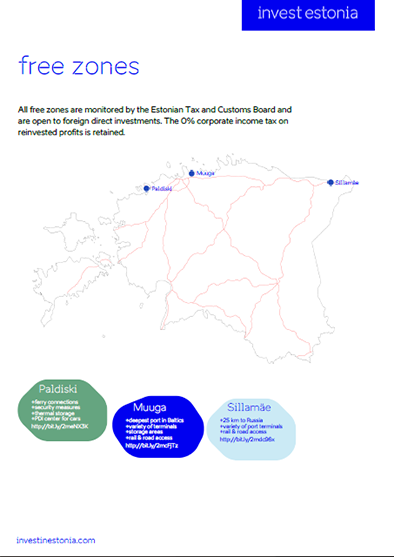 Estonia’s journey began in the 1990s as a nearshoring location of choice for Nordic companies. Since then the sector has expanded significantly, diversifying the functions covered and up-tiering in sophistication. **80+ SSC centers** Today there are over 80 captive, BPO and ITO shared service centres in Estonia employing 8,000+ people. Multifunctional centres with regional or global responsibility and multilingual teams, such as ABB and Stora Enso, become the norm. Traditional strengths in IT and finance are augmented by growing expertise in supply chain and HR management. Estonia also specialises in government services, Tallinn being home to the EU LISA centre for operational management of large-scale IT systems and the NATO Cooperative Cyber Defence Centre of Excellence. ***Digital logistics in Estonia*** Estonia is a world leader in the development and application of digital logistics. From data analytics and country single windows to mobile apps and delivery robots, Estonia improves supply chain efficiency and client experience from the first mile to last. **From first mile to last** Estonia is applying its world-class IT and engineering expertise to revolutionise supply chain efficiency and client experience from the first mile to last. Estonia has a sizeable logistics industry thanks to a strategic location which makes it an effective supply chain hub for the Nordic, Baltic and northwest Russian regions. The industry has applied IT extensively for 20yrs, from early automation of goods and documents to modern day application of advanced robotics and data analytics. **Strong references** By combining a pro-business environment ideal for R&D with world-class skills in IT and engineering, Estonia has produced numerous digital logistics innovations. Starship Technologies‘ autonomous delivery robots have received strategic investment from Daimler AG; Cleveron parcel delivery solutions are adopted globally by Walmart, ASDA and Inditex; Tpilet smart ticketing has been acquired by Norges Statsbaner. Should a location proposal be included? Which template should be used for the location proposal map? Should a map of industrial parks be included? Which template should be used for the industrial parks map? Should a map of free zones be included? Which template should be used for the free zones map? Should a case study be included? Which case studies should be included? Manual selection overrides default values. Should the summary page be included?